One of the most challenging tasks facing today’s pest management professional is managing ants in urban environments. Ants are huge drivers of pest control business and, when handled with effective techniques, provide great value to customers. It’s hard to completely exclude them from structures. Ants search for nutrients, moisture and controlled climates inside structures, and only need a small entry point to gain access. There are lots of them. Ants are one of the most prolific groups of organisms on the planet, with high diversity and seemingly endless numbers. Control measures are often species-specific. Techniques effective for one species may be ineffective for a similar-looking ant in the same region. Identification requires expertise. Features used to identify ants, like antennal segments, hairs and spines, often require magnification to see. A well-trained technician must be able to perform basic ant identification in the field and understand effective techniques for the ant species in their region. Ant identification can be daunting, but using a high-quality hand lens is a great place to start. With practice, it is possible to identify most common species without magnification once familiar with general size, color and behavioral characteristics. Always have sample-collecting tools on hand (such as rubbing alcohol and an appropriate container) in case you encounter something unfamiliar. Collecting a sample gives you the opportunity to learn about another species. There are various resources available if you need help identifying an unfamiliar ant. Once the species is identified, the real work begins: developing a plan to manage the population. Thankfully, there are many Syngenta bait and spray products labeled for ants. It is recommended to have multiple products on hand so you can test them in small placements, as efficacy can vary across species, seasons and regions. Gel baits and granular baits are effective across a broad range of species, but bait matrices can vary by formulation and may be preferred by some ant species, but not by others. Advion® Ant gel bait combines food-grade inert carriers, attractants and carbohydrates to enhance its appeal to all key sweet-feeding ant species. Some baits are specific to particular ant species. Advion fire ant bait, for example, is specifically designed to appeal to protein-feeding ants like fire ants, and can ensure total colony control of fire ants within 24-72 hours. It is also part of the SecureChoice℠ Fire Ant Assurance Program, which guarantees at least 90 percent control of active fire ant mounds by following the recommended treatment protocol. Liquid residual applications are useful for preventive maintenance and control of super-colony species like Argentine and tawny crazy ants. Tandem® insecticide features systemic action that helps control homopterous pests like aphids, which are a food source for ants. 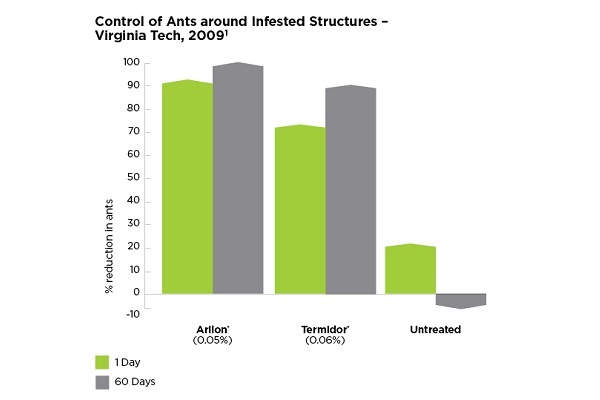 Additionally, Arilon® insecticide can be used for broad-spectrum ant control with its non-pyrethroid, non-neonicotinoid formulation. With the proper educational resources and tools, you can step up to the challenge and help provide an ant-free environment for customers. For more information, visit www.SyngentaPMP.com. In the State of New York, Tandem may only be applied for indoor uses. ©2018 Syngenta. Important: Always read and follow label instructions. Some products may not be registered for sale or use in all states or counties and/or may have state-specific use requirements. Please check with your local extension service to ensure registration and proper use. Advion®, Arilon®, For Life Uninterrupted™, SecureChoice℠, Tandem® and the Syngenta logo are trademarks or service marks of a Syngenta Group Company. All other trademarks are the property of their respective owners. Syngenta Customer Center: 1-866-SYNGENT(A) (796-4368).